I wanted to see Russia and thought this would be a good way. I would definitely recommend the Viking cruise. The dock in St Petersburg is out in an industrial area so if you want to explore on your own you will need a taxi. I believe it is possible to take a city bus to the Metro station on the other side of the river. There is an ATM in a souvenir shop on the dock if you need Rubles. In Moscow the Metro station is closer to the dock if you want more free time in town. We were able to see a lot in St Petersburg and Moscow, but the river trip between them really gave me a change to see more of Russia. Unlike the western Europe trip there was more time spent on Russian History, the Russian language and showing us a Russian home, which I found interesting. I was surprised at how open and honest our guides were. They did a great job showing us their country. I returned with a better understanding of Russia and its people than I had before. I felt safe everywhere we went, and really enjoyed the trip. The ship and cabin were very nice but the ships on the Rhine had a better layout. The food was very well prepared and I really liked that a lot of the staff were Russian. On our Rhine cruise there was one management level person who was Austrian, the rest were from the Philippines. They were all competent on both trips, but it was great to interact with the people from the country you are visiting. One mistake we made was not taking the optional tour of the Hermitage. The museum was extremely crowded and difficult to see much. Skip one of the other optional tours in St Petersburg but take the optional Hermitage tour and also Peterhof Palace and garden. We had a great time in Russia. I wanted to see Russia and thought this would be a good way. I would definitely recommend the Viking cruise. The dock in St Petersburg is out in an industrial area so if you want to explore on your own you will need a taxi. I believe it is possible to take a city bus to the Metro station on the other side of the river. There is an ATM in a souvenir shop on the dock if you need Rubles. In Moscow the Metro station is closer to the dock if you want more free time in town. 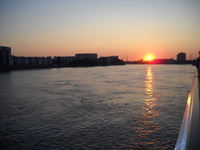 We were able to see a lot in St Petersburg and Moscow, but the river trip between them really gave me a change to see more of Russia. Unlike the western Europe trip there was more time spent on Russian History, the Russian language and showing us a Russian home, which I found interesting. I was surprised at how open and honest our guides were. They did a great job showing us their country. I returned with a better understanding of Russia and its people than I had before. I felt safe everywhere we went, and really enjoyed the trip. The ship and cabin were very nice but the ships on the Rhine had a better layout. The food was very well prepared and I really liked that a lot of the staff were Russian. On our Rhine cruise there was one management level person who was Austrian, the rest were from the Philippines. They were all competent on both trips, but it was great to interact with the people from the country you are visiting. One mistake we made was not taking the optional tour of the Hermitage. The museum was extremely crowded and difficult to see much. Skip one of the other optional tours in St Petersburg but take the optional Hermitage tour and also Peterhof Palace and garden. We had a great time in Russia. Cabin was small but comfortable. 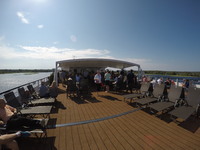 The veranda was especially nice for the cruising part of the journey.